If cancellation is made before eight weeks to arrival, the paid sum will not be refunded, it can be held over to a date, subject to availability, later in the year or following year. If this option is taken, a £49 handling charge will be due. If you roll over to another date for which a higher sum is charged, you will need to pay the difference. If cancellation is less than eight weeks from arrival date, the deposit (30% of the total sum, excluding any bond) will not be refunded and cannot be rolled over to a later date. If cancellation is made within three weeks of the arrival date, 100% of the total sum will not be refunded (as generally we cannot re-let the tent in that time) and cannot be rolled over to a later date. Any cancellation or change must be confirmed in writing/e-mail by the person who made the booking. In the event that we need to cancel your holiday, we shall inform you as soon as possible and refund all money paid to us, by you, within 14 days. The closest major airport to York is Leeds-Bradford International Airport (LBA). We are only eight miles away from York city centre. For a variety of ways to cook, we provide a BBQ and two gas rings, just for those bacon butties on a morning. The beds are ideal for a family, with a four-poster bed for the parents and single beds and sofa bed for the children. Groups fit in well too, with the birthday boy/girl getting the fancy bed and the gang getting the rest! The veranda is a great place to just sit back, relax and have a cold beer. Ideal for glamping couples (sleeps up to four people)! It offers a whopping living area of 6 x 4 metres. This style of tent has a wood-burning stove, plenty of bedding and hot water bottles to keep you toasty in the cooler months. For sleeping, there is a double sofa bed and a king-size bed to choose from. The living space is larger than the current Bell Tents we have to offer, so it’s really spacious for couples. As with the Bell Tents, the Superior Bells have a cooking hut that provides all cooking facilities and storage space. Between the cooking hut and the tent is a large canvas awning giving you a dry outside dining/lounging area. Superior Bell Tent guests use the shower and toilet huts near the tea tent that have instantaneous hot water and powerful showers. The fabulous woodcutters huts are like a shepherds hut, but at a spacious 6 x 3 metres, they are a lot bigger! 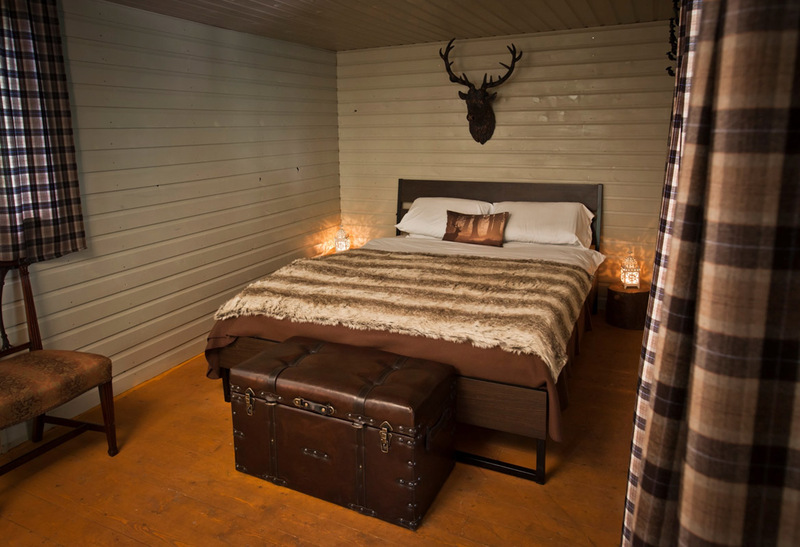 These cosy, insulated huts are double glazed and decked out in warm tweeds. They're the perfect woodland retreat if you’re looking for more comfort than a traditional tent. Theses comfortable huts are perfect for a romantic retreat or for families with young children. With its huge awning it has excellent barbequing conditions all year round, so there’s no excuse about rain! Bathroom facilities are upscale baths shared by the community. Due to surrounding wildlife and our request, we do not allow pets onto the campsite. Stamford Bridge is only a 15-minute walk and hikes are a 10-minute car ride away.